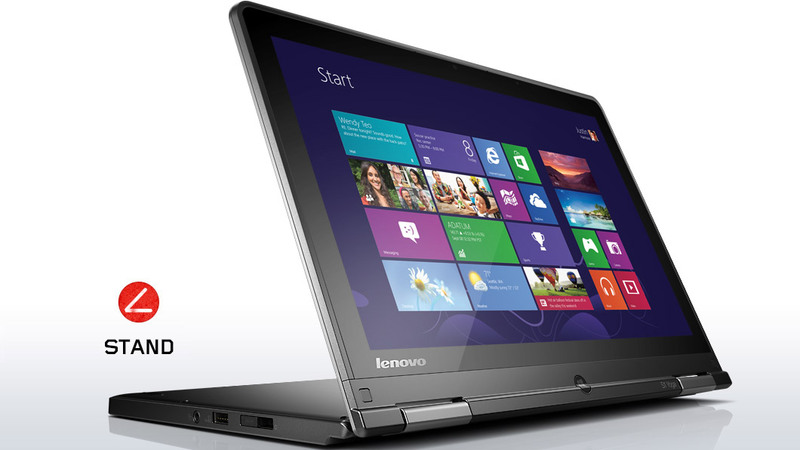 Lenovo's portfolio of Yoga devices keeps on growing. 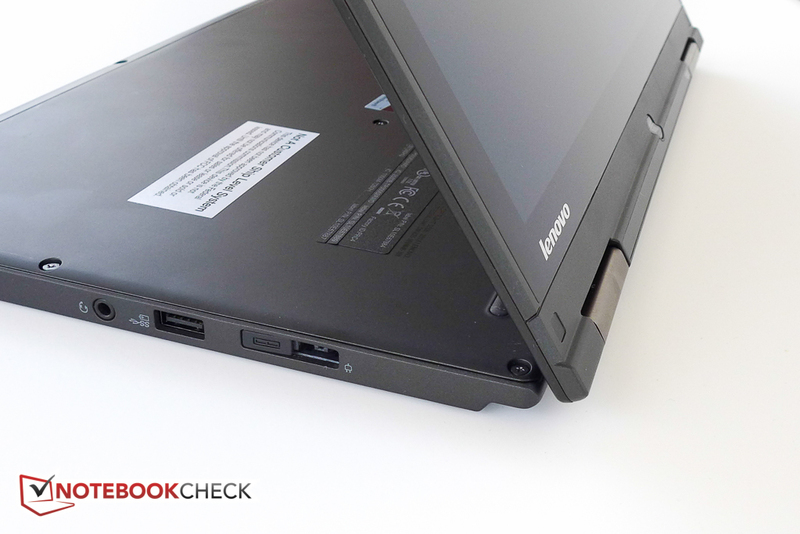 The successful 360-flip convertible design Lenovo introduced with the IdeaPad Yoga 13 allows the new ThinkPad Yoga to convert from Ultrabook to tablet mode while still promising the performance and ergonomics of a standard clamshell notebook. 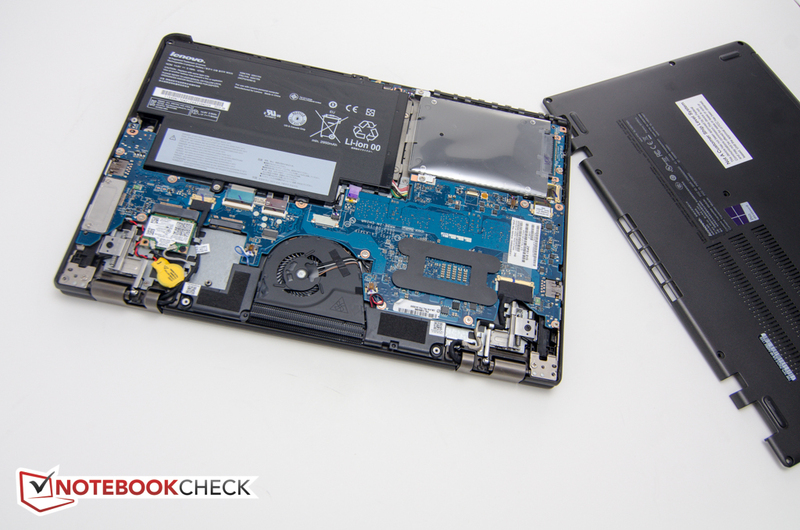 Just last week we took a look at the new thinner, lighter, and more powerful successor in the consumer line, the IdeaPad Yoga 2 Pro with QHD+ resolution. 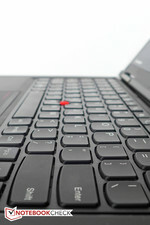 On the business end, customers so far had to contend with the rather unconventional 11.6-inch ThinkPad Helix, the single-hinge, more mainstream 12.5-inch convertible ThinkPad Twist, or the tried-and-true, but much thicker and heavier 12.5-inch ThinkPad X230T. 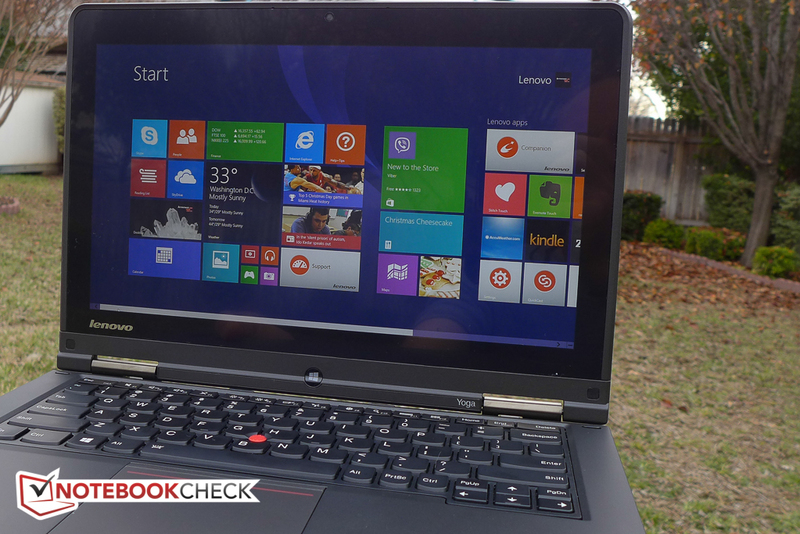 In this review, we will take a closer look at the ThinkPad Yoga, Lenovo's 12.5-inch business convertible with a Haswell 1.6 GHz Intel Core i5-4200U processor (3MB Cache, up to 2.60GHz), integrated HD 4400 graphics, 4 GB RAM, 128 GB SSD, and a FHD (1920 x 1080) IPS display. 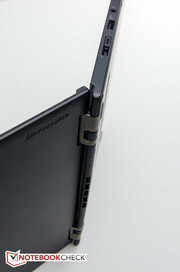 In the US, this lower-end, but still quite powerful version sells for $1299 directly from Lenovo. At the time of writing, Lenovo offers three additional processor choices (i5-4300, i7-4500U, and i7-4600U) and a upgrade from a 128 GB SSD to a 256 GB SSD for $150 more. The two i5 CPUs come with 4 GB of RAM maximum; the two i7 processors automatically up the RAM to a total of 8 GB. The version of the Ultrabook with i7-4500U and 8 GB of RAM costs $160 more than the base version according to Lenovo's online shop - fairly reasonable, we think. It's important to note here that even the base version includes an active digitizer pen, which we will talk about in detail later. Of course, Lenovo is not the only company with hybrid notebook/tablet concepts and the competition is fierce: Dell has their well-received XPS 12, Sony the 11.6-inch Vaio Duo 11 and the 13.3-inch Vaio Duo 13, and HP has the 11.6-inch EliteBook Revolve 810, just to name a few. Given the multitude of hybrid designs from other manufacturers as well as the competition from within, does the new multimode business Ultrabook offer enough to stand out from the crowd? As it is fairly typical for ThinkPads, the new Yoga doesn't stray too much from the classic, understated design philosophy, which has been a staple of the line for many years now. The body utilizes the familiar magnesium-alloy frame and comes with the updated smooth black surface design instead of the older, soft-touch finish. 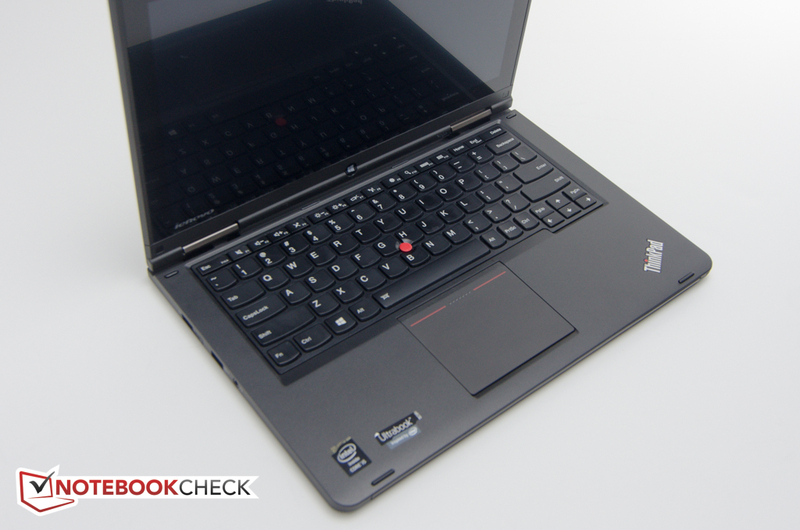 The ThinkPad Yoga measures 316.5 x 221 x 19.3 millimeter, which is almost identical to the Dell XPS 12. Fit, finish, and build quality are excellent: there are no sharp edges anywhere on this Ultrabook, and the corners are nicely rounded, so holding the convertible in tablet mode isn't much of a chore despite the higher weight compared to a dedicated tablet. 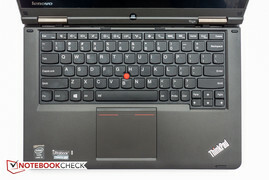 Speaking of weight: the ThinkPad Yoga tips our scale at 1584 grams, which is lighter than the 11.6-inch ThinkPad Helix with its detachable base at 1670 grams, but heavier than either the Dell XPS 12 or Lenovo's own larger Yoga 2 Pro Convertible at 1500 and 1398 grams, respectively. Of course, the later uses plastic for most of its construction, which helps to account for the difference. The power adapter with its cord adds another 238 grams to the total. The Yoga is also quite sturdy: the keyboard area and the palm rest barely have any give whatsoever and the base unit resists twisting quite well with no creaking. The display, which is covered by a heavy-duty layer of scratch-resistant Corning Gorilla Glass, is torsionally less rigid, although we couldn't induce any ripples on the screen no matter how hard we tried. 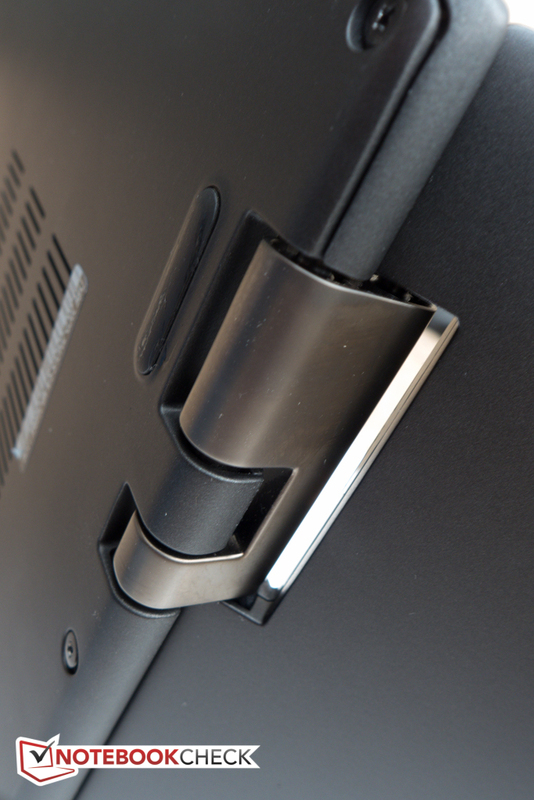 The hinges are made from a zinc alloy and are sufficiently large and strong to hold the display at any angle, although a little bit of display bounce can still occur. Lenovo's hinge design allows the touchscreen to flip around 360 degrees, which allows the user to select four modes — Laptop, Stand, Tablet, and Tent — based on the task at hand. 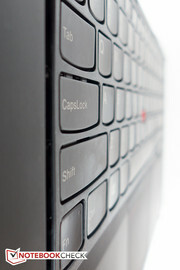 A unique feature of the ThinkPad Yoga and also a major differentiator between it and the IdeaPad Yoga is the mechanical locking feature of the keyboard, which Lenovo calls "Lift n' Lock". When the screen is folded backwards into tablet mode, the keyboard tray rises up until it's flush with the keys and locks the keys in place so they can't be pushed. The touchpad is also automatically disabled. The benefit: accidental inputs are avoided and the keyboard deck now presents a uniformly smooth area which is easier to hold and less likely to get caught on something. 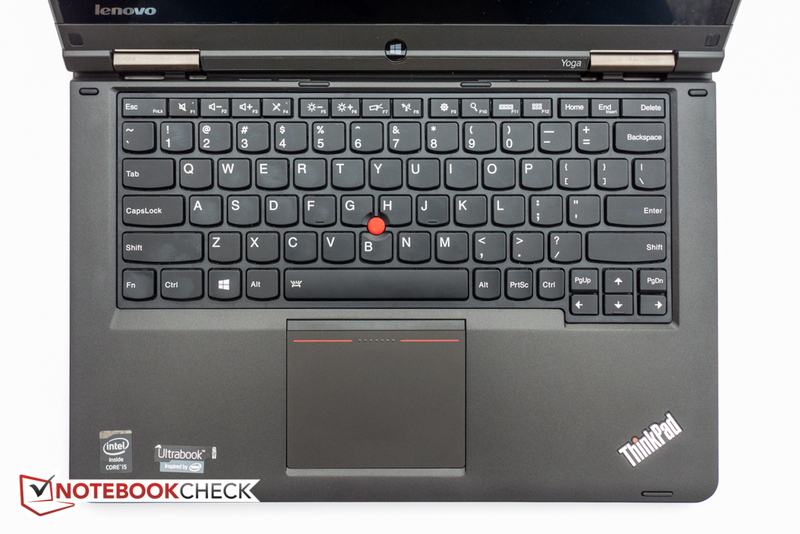 According to Lenovo, the rising keyboard frame-design was tested 25K times from close to tablet and 5K times from close to notebook, which means that the mechanical components should hold up well over time. 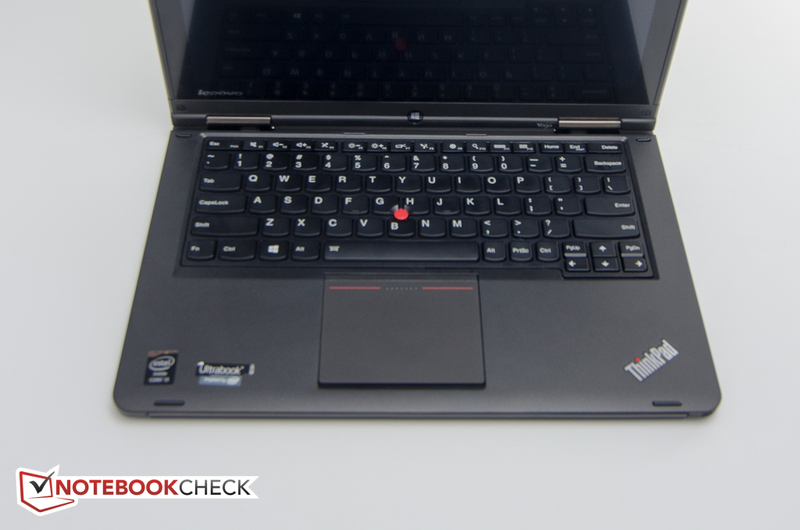 While maybe not as visually stunning as some of the current top-of-the line Ultrabooks from Samsung, Asus, or Apple, we really like the overall design of the ThinkPad Yoga, which is decidedly high-end without touting it. Since the hinges take up the rear and the convertible has the front and rear edges resting on the surface whilst in Tent Mode, all ports are housed on the left- and right-hand sides. The layout is commendable, since all the ports are located at or behind the beginning of the keyboard tray, which avoids a tangle of cables and possible issues with the operation of a mouse. The two USB 3.0 ports are split up between the left and the right side (the right one offers always-on device charging), which we also appreciate, since a larger device in one port won't block the other. Since the Yoga also functions as a tablet, the power button, a volume rocker switch, and a screen rotation lock have been banned to the right-hand side within easy reach of the right hand. The familiar Windows home button sits at the base of the display. All the way up front on the right side is the storage slot for the digitizer pen. Notably absent are an Ethernet port as well as VGA-out, which is still offered on some Ultrabooks (usually via a dongle). The sole display output thus is Mini-HDMI. The 720p webcam is good enough for videoconferencing, but a bit noisy in low-light conditions. 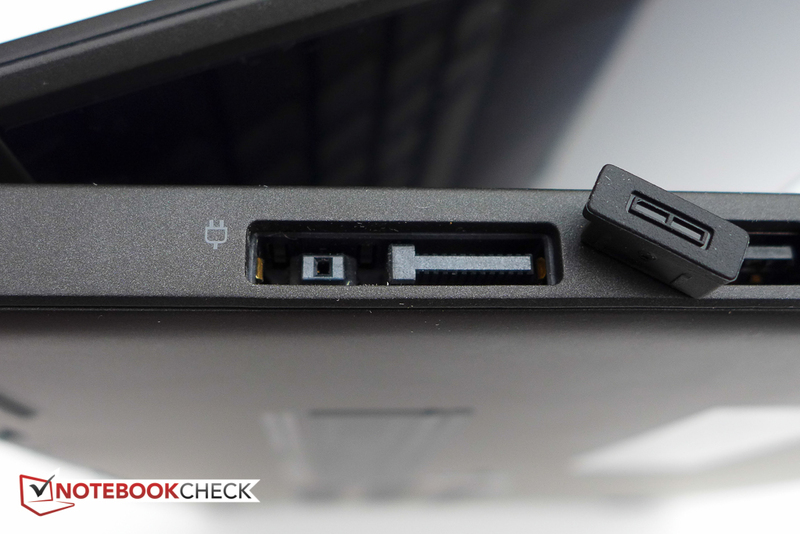 For those who need the RJ45 Ethernet port, Lenovo offers the ThinkPad OneLink Dock, which offers 2x USB 3.0, a combo audio port, 2x USB 2.0, full-sized HDMI, and Gigabit Ethernet. 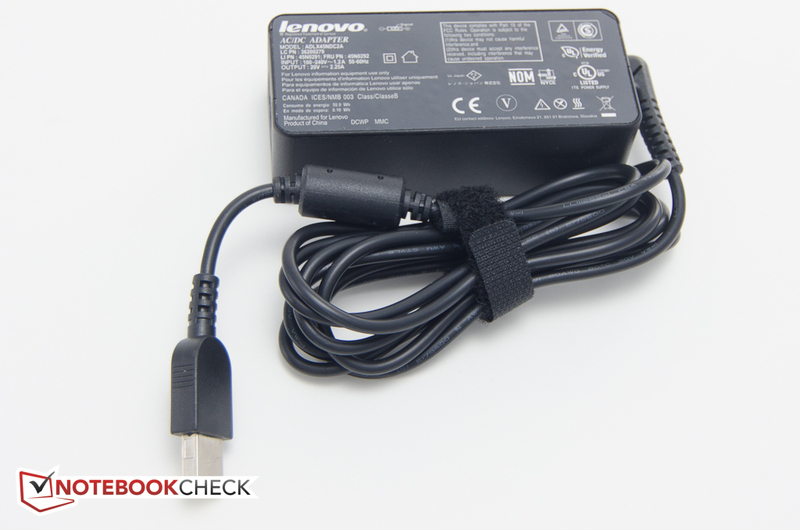 The OneLink Dock plugs into a special connector - which is protected by a rubber plug when not in use - on the left side right next to the power jack. Our review model's sole connectivity to the outside world is handled by a wireless module from Intel. The Wireless-N 7260 is a 2x2 adapter which supports both the 2.4 GHz and the 5 GHz band and is capable of a theoretical throughput of 300 Mbps. The module also supports Bluetooth 4.0 + HS for connectivity with devices like keyboards, mice, or speakers. 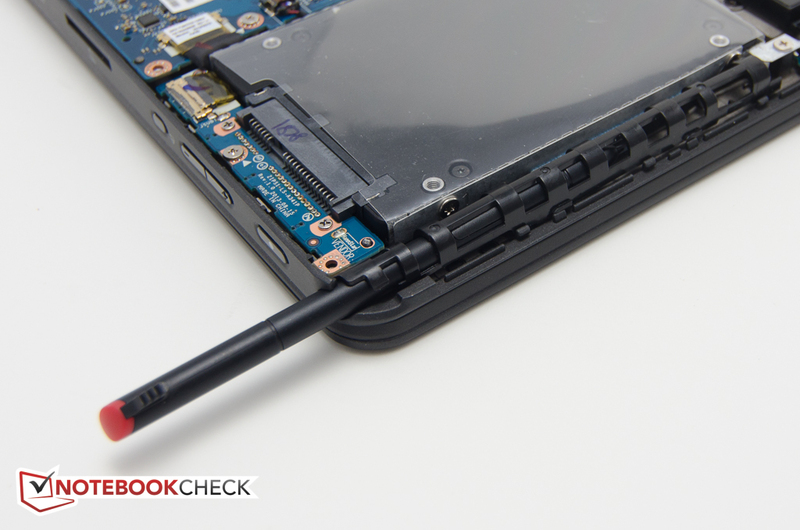 Interestingly enough, the configurator on Lenovo's website lists the ClickPad "without NFC antenna & module" as the only option, leading us to believe that NFC will be available at one point in the future. 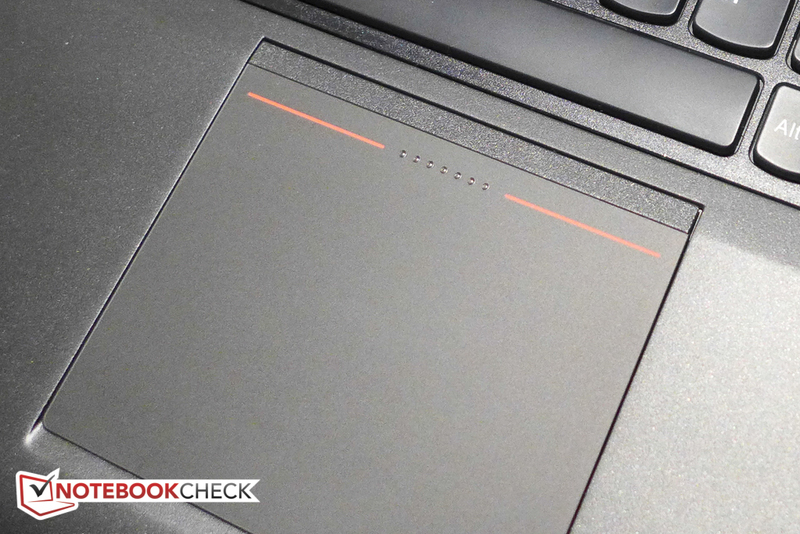 As a notebook designed for business, the ThinkPad Yoga ships with a TPM chip, which can be enabled in the BIOS. Together with Windows 8.1 Professional, the user can thus protect and tamper-proof the Windows operating system. Features like a fingerprint reader or security card slot are not offered. Aside from the Ultrabook itself, the power adapter, and a short quickstart guide, the shipping carton is empty. Interesting accessories available online are the aforementioned ThinkPad OneLink Dock for $120 and a 65W DC Travel Adapter for auto and air use for $60. 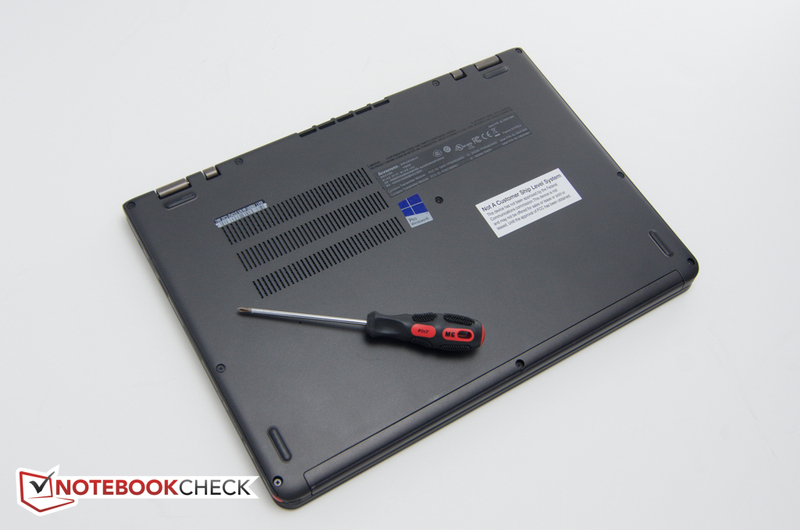 Lenovo supplies the ThinkPad Yoga with a standard 12 month depot warranty, but also offers fairly extensive additional coverage options including up to 5 years total warranty, on-site service, as well as accidental damage protection, and keep your drive. 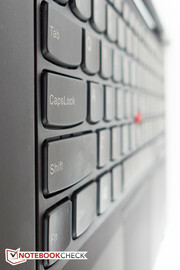 ThinkPad keyboards are widely considered to be among the best in the industry, even though there was an outcry in the community when Lenovo switched to the chiclet AccuType design. The keyboard on this 12.5-inch Ultrabook is actually only about 6 % smaller than the keyboard on the workstation-model W530 (26.5 cm vs. 28.2 cm; key size of 15 mm vs. 16 mm), although the Alt, PrtSc, and Ctrl keys on the right side are not full-sized like they are on the bigger brothers. The key travel distance is of course much shorter, required pressure for actuation is less, and the stop is much more abrupt. We also like the fact that the top row can be toggled between Fn-key and system settings control with a simultaneous press of the Fn and the Esc key. 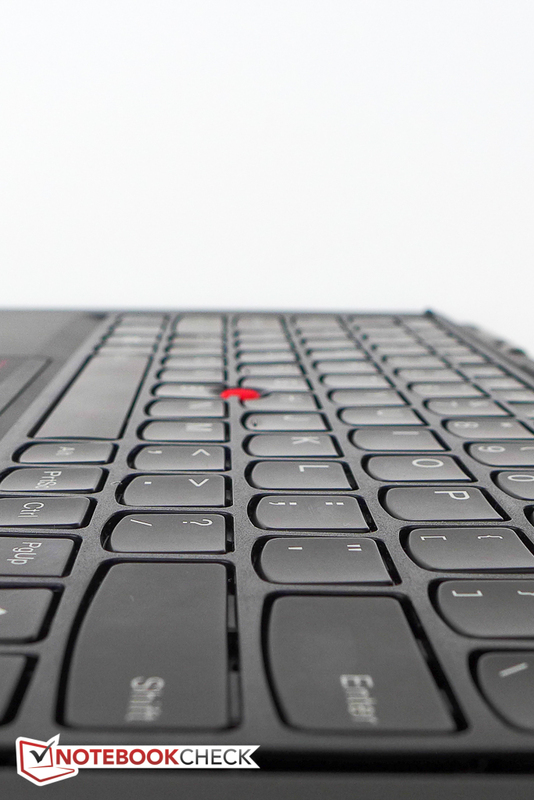 In our opinion some full-sized laptops could benefit from a keyboard as responsive as the on included on the ThinkPad Yoga. Despite the low travel, the tactile feedback is still good and the keyboard is well suited for touch typists. 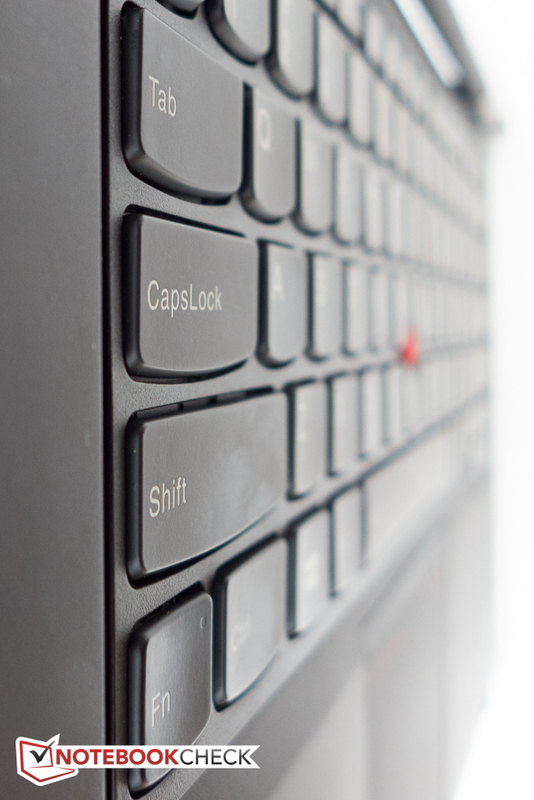 There is no flex even during spirited typing sessions, and the the two-level backlight increases typing accuracy in dimly-lit environments. 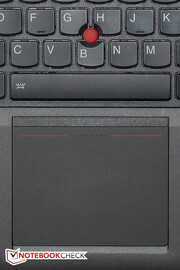 Many members of the Thinkpad community not only complained about the appearance of the chiclet keyboard, but also the subsequent changes to the touchpad and trackpoint pointing devices, both of which now lack any dedicated buttons (the previous generation still had buttons for the trackpoint). As far as modern touchpads go, this one is a revelation: while not one of the largest at 87 x 67 mm, the touchpad with its smooth surface and very satisfying click-quality and feedback is a pleasure to use. There are five buttons altogether, as the top row for the trackpoint also contains a middle button. 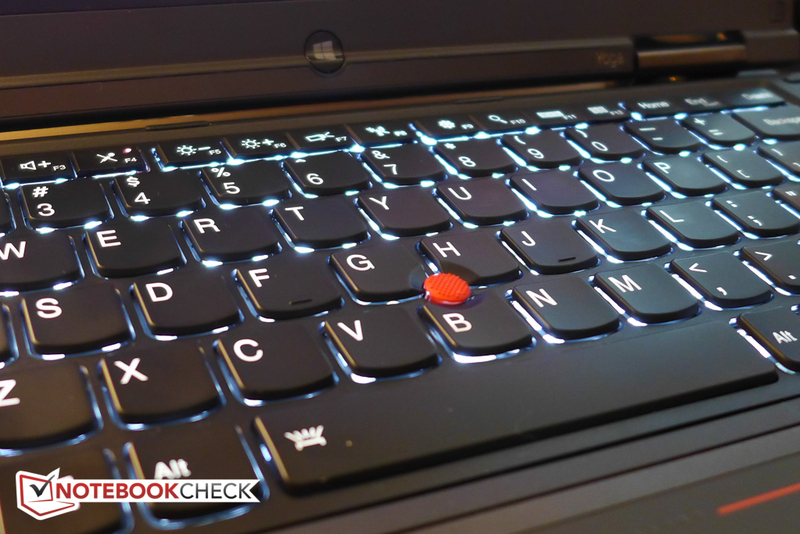 While tapping works for the touchpad left and right clicks, the trackpoint requires physical clicks in order to register inputs. We had no issues with the touchpad whatsoever and swipes as well as multi-touch gestures worked extremely well. The Synaptics control panel offers a multitude of configuration options, including gestures for up to four fingers. The only minor complaint we have - and that's only if we want to be really picky - is the fact that the touchpad rattles slightly when tapped. We should also add that while in tablet mode, the touchpad does not lock in place like the keyboard, although inputs are of course disabled. The 10-point multi-touch panel translates inputs smoothly and without an noticeable delays. Thanks to the layer of glass, the screen should be able to handle rougher treatment than the larger IdeaPad Yoga, which reportedly has a flimsier screen. The Tent Mode on a hard surface prevents the display bounce we noticed when using the touchscreen in the normal laptop configuration. 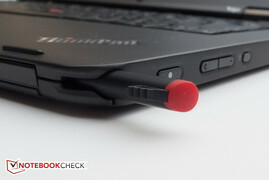 Lenovo ships the ThinkPad Yoga with a Wacom digitizer pen, which sits in a slot parallel to the front edge and gets inserted from the right-hand side. The pen is quite skinny and not that comfortable to hold for longer periods of time. Although the last part of the pen is red, it's not equipped with the eraser-nib that's usually found on the full-sized pens. With the newer Windows Ink Collection API, programs like Fresh Paint (a free download from the Microsoft Store) or Microsoft OneNote work with the pressure sensitive stylus out of the box (1024 levels are supported). Other programs, like Adobe's Photoshop, might require additional drivers. During our tests, the pen tracked well with a slight offset (not really unusual for Wacom pens) and as good as no latency whatsoever. Palm rejection also seemed to work well, which is not always a given. Although we didn't try it, regular Wacom pens should also work and might be more comfortable than the stylus that ships with the convertible. The 12.5" FHD IPS screen offers a resolution of 1920 x 1080 pixels, which is on par with the Dell XPS 12 and the 13.3-inch Vaio Duo 13,. 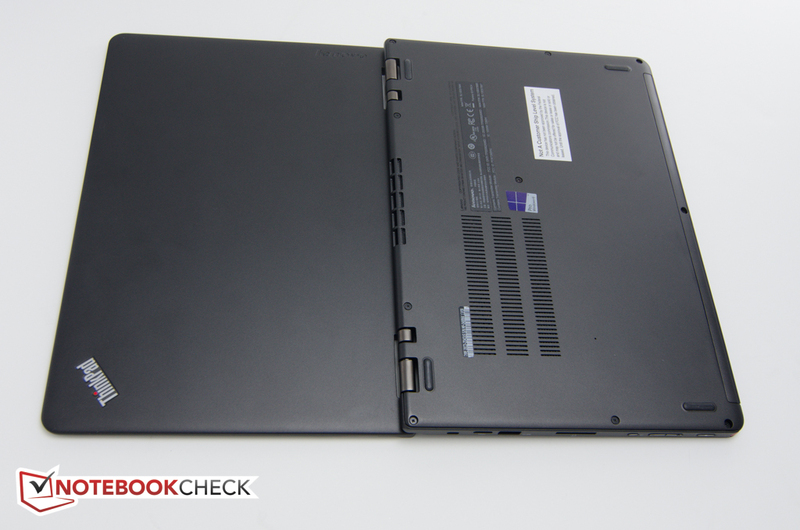 The original IdeaPad Yoga 13 had 1600 x 900 pixels; the new model IdeaPad Yoga 2 Pro has 3200 x 1800. The display sits behind a layer of Corning Gorilla Glass, which is not quite an edge-to-edge design, since there is a small frame that surrounds the display on the top and the sides. This frame offers some protection for the screen when the lid is closed, but it does not get in the way at all when swiping from the left or the right. Text is very sharp even with small fonts, although occasionally some fonts or title bars can look strange and fuzzy, which reportedly is a issue with the way Windows 8 scales fonts. The default scaling of 125 % works well as far as general readability and icon sizes are concerned. We measured an average brightness of around 370 nits across nine quadrants; the maximum in the center is just over 400 nits, which matches Lenovo's claim exactly and is very good for this class. The brightness decreased to about 328 nits in the center even with the Performance profile enabled while on battery, so the full potential is not available when away from an outlet. The contrast and black value of 625:1 and 0.64, respectively, compare well to the XPS 12 with 412:1 and 0.83, although the Sony Vaio Duo 13 offers an astounding 1150:1 and consequently even deeper blacks. 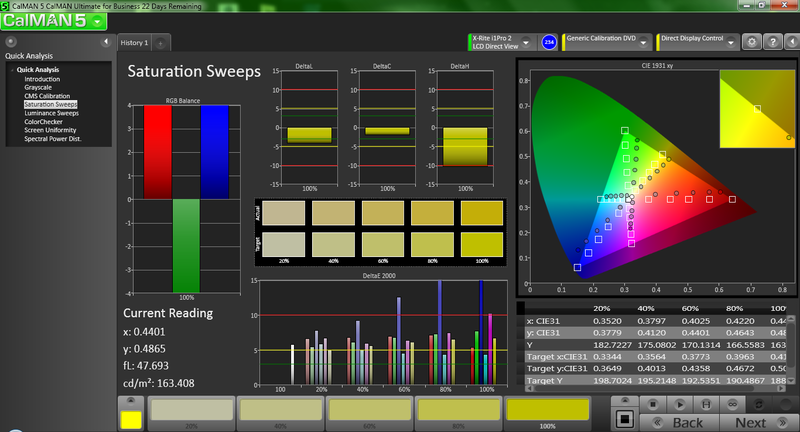 Color space coverage is decent at almost 60 percent of the sRGB and 43 % of the AdobeRGB standards, which is within a few percentage points of the Dell XPS 12. Professional graphic artists who require better accuracy will find the Sony Vaio Duo 13 with an sRGB coverage of 93 % a much better fit though. 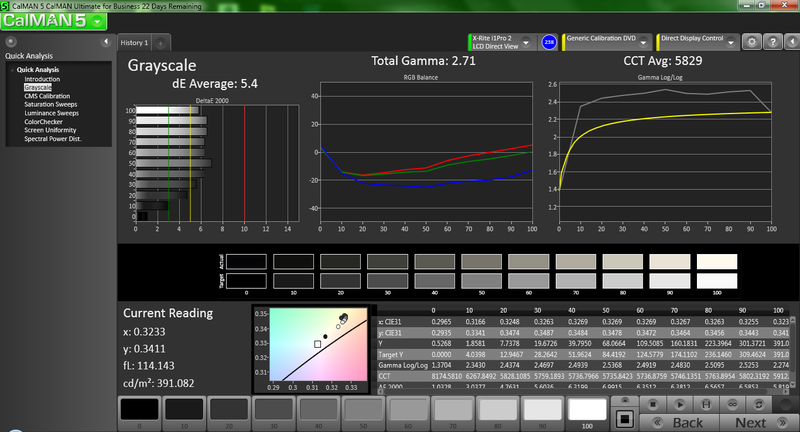 As shipped, the display exhibits an average DeltaE of slightly over 6 with a maximum of 13 for blue and a total gamma of 2.71 (ideal 2.2) and color temperature of 5830 (ideal 6500K). After calibration, the average and maximum DeltaE didn't change much at 5 and 13 (once again for blue), although both the gamma and the color temperature improved slightly (2.35 / 6100K). While the color accuracy is nothing to get too excited about, the above measurements are not to suggest that there are serious faults with the display, as it is quite pleasant to look at. If color accuracy is of utmost importance to you, the Sony Vaio Duo 13 with the Triluminos display does a better job rendering colors. 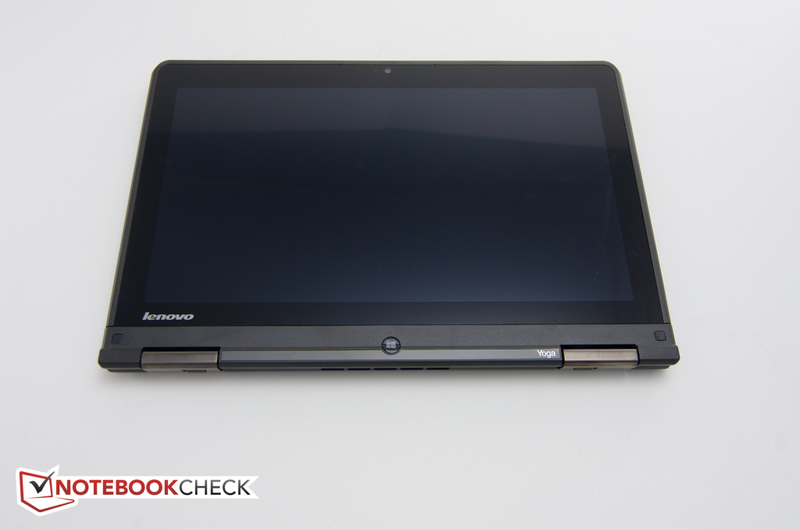 While we couldn't find any information about any kind of panel surface treatment on Lenovo's website, there is no question that the ThinkPad Yoga has some type of anti-glare coating applied, as it is much less reflective than typical glossy screens. Reflections are consequently much less of an issue despite the somewhat lower screen brightness on battery and we had no problem using the Ultrabook outside on an overcast day. Typical for IPS displays, the viewing angle stability is excellent and we didn't experience any significant deterioration of color quality, contrast, or brightness even at more extreme angles. Sharing the screen is possible without restrictions - although the rather smallish size of the display might be a more limiting factor. 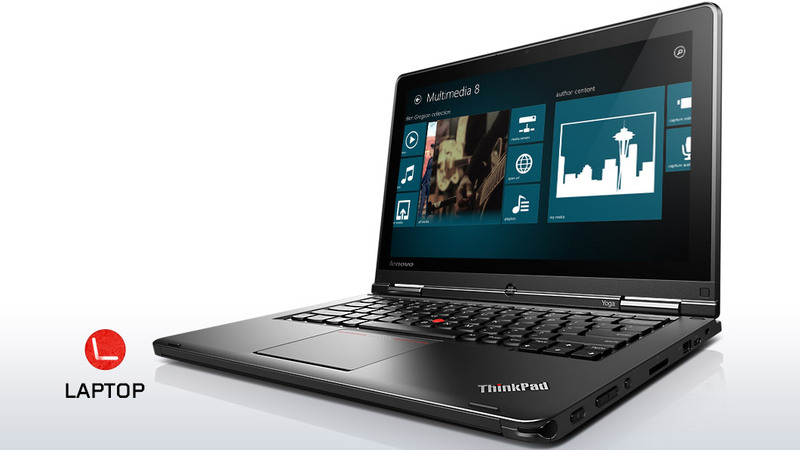 As we mentioned already, at the time of writing, the ThinkPad Yoga is available with either the i5-4200U, i5-4300U, i7-4500U, or i7-4600U 4th generation Intel Haswell CPU. Either 4 or 8 GB of dual-channel DDR3L RAM are soldered onto the motherboard, so they can't be upgraded later. The SSD choices are either 128 or 256 GB 2.5-inch (7 mm) drives, which is good news, since it should be less expensive to upgrade to a larger size down the line. None of the versions are available with dedicated graphics card and thus make use of the integrated HD 4400. Our review model is the lowest configuration available and equipped with a Core i5-4200U processor, 4 GB of RAM, and the 128 GB SSD. The new low voltage Core i5-4200U is a dual-core CPU with a clock speed of 1.6 GHz (Turbo Boost maximum is 2.6 GHz) and a TDP of 15 watts. Performance-wise, this CPU compares well to the previous-generation i5-3317U, which is clocked slightly higher at 1.7 GHz and consumes a bit more power (TDP 17 watts). 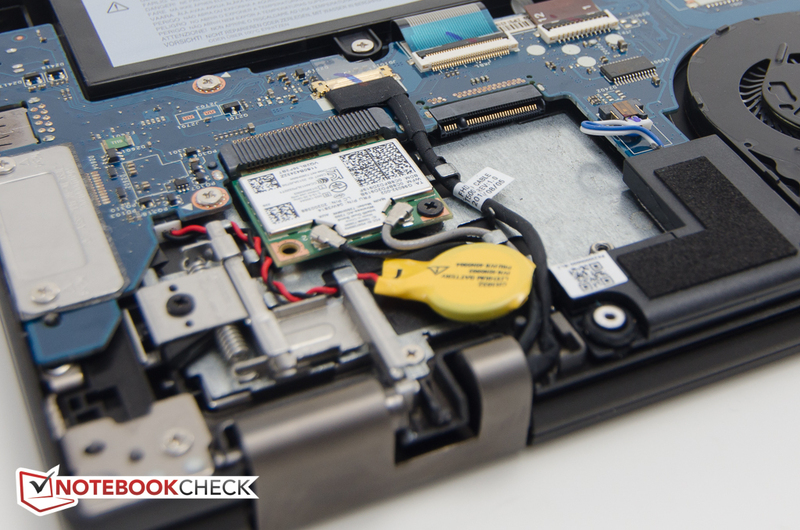 The Cinebench R11.5 scores show a slight performance edge for the i5-4200U: while our review Ultrabook scored 2.5 points for the Multi test, the ThinkPad Helix, which uses the older Ivy Bridge CPU, scored 2.38 points - or about 5 % lower. The Dell XPS 12, which is equipped with the same processor as our review model, posted an almost identical score of 2.48 points. The 1024M wPrime scores of the ThinkPad Yoga and the Helix are nearly identical, however (about 719 vs. 721 seconds). The Microsoft Surface Pro 2 Tablet, which also has the i5-4200U, is quite a bit faster by about 9 % (661 seconds). 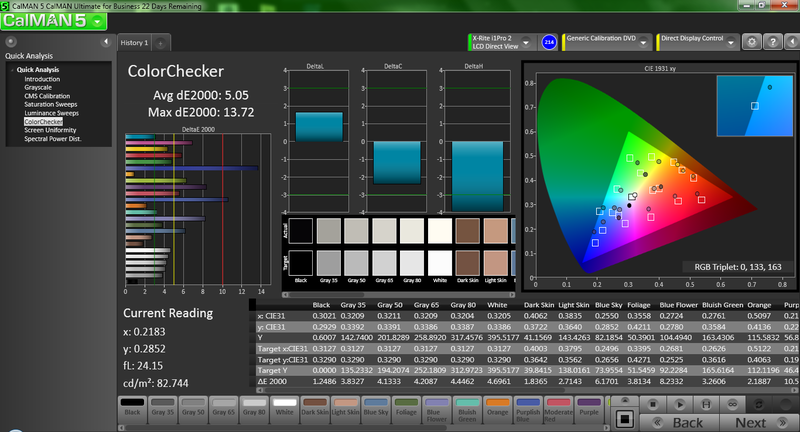 To get an overall idea of the system performance, we use the benchmark test PCMark 7. 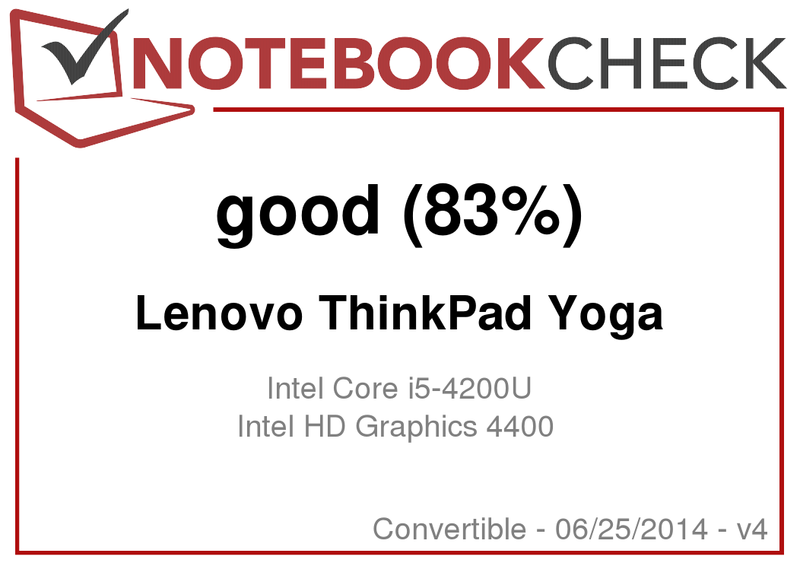 Since the Yoga is equipped with a SSD drive, we expect good results here and are not disappointed: 4749 points is a very good score, although it falls short of the XPS 12 at 4900 (+ 3 %). 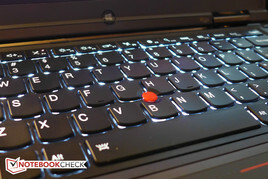 The ThinkPad Helix with the older Ivy Bridge CPU is only a little slower at 4669 points. The Vaio Duo 13 with the same CPU scored 4594 points (- 3%). 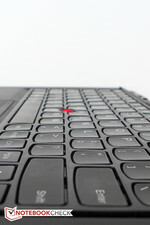 As for the subjective user experience, the ThinkPad Yoga handles all but the most resource-intensive tasks with aplomb. The system boots in just about 14 seconds and application starts are very quick, courtesy of the SSD drive. According to CrystalDiskMark, the 128 GB Samsung PM841 Series MZ7TD128HAFV-000L1 SSD offers very good read, but not particularly impressive write performances of 525 MB/s and 136 MB/s, respectively. The average transfer rate of 430 MB/s is very good and outperforms the mSATA SSD Dell uses for the XPS 12 (366 MB/s) as well as the Sony Vaio Duo 13 (308 MB/s). The 4K read and write performance is also outstanding at about 31 and 93 MB/s. A comprehensive list of drives and their performance can be found in our benchmark list here. For the graphics engine, Lenovo relies on the CPU-integrated Intel HD Graphics 4400, which offers clock rate from 200 to 1000 MHz (Turbo Boost). 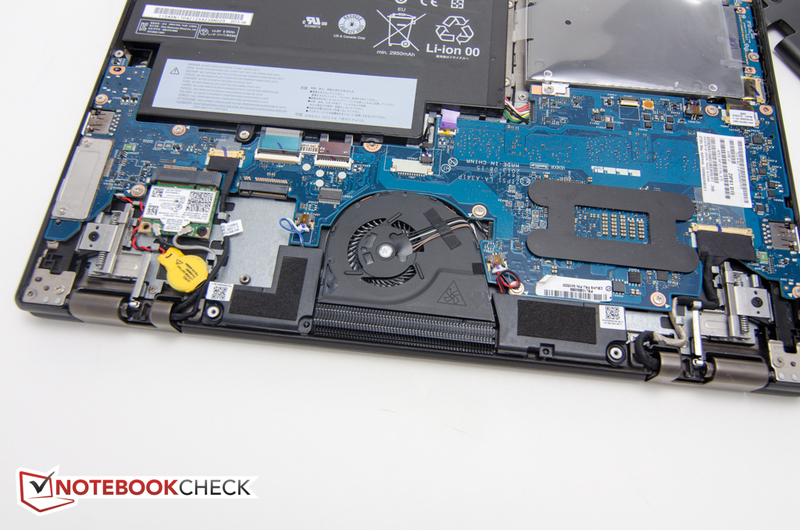 During our benchmark testing we discovered that the ThinkPad Yoga can't use the maximum Turbo Boost frequency under load - a common problem affecting other notebooks as well. When running Furmark, for example, the GPU quickly drops to about 700 MHz. We will revisit this topic in the section entitled "Stress Test". 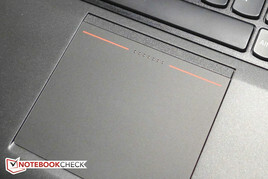 Thanks to the dual-channel memory configuration, the ThinkPad Yoga still does decent in the synthetic benchmark scores. For 3DMark Ice Storm, for example, we recorded 39054 points, which is significantly faster than the ThinkPad Helix with the Ivy Bridge HD 4000, which scored 22115 points here (- 43 %). As expected, the gaming tests show that the ThinkPad Yoga can only handle older and less demanding games. 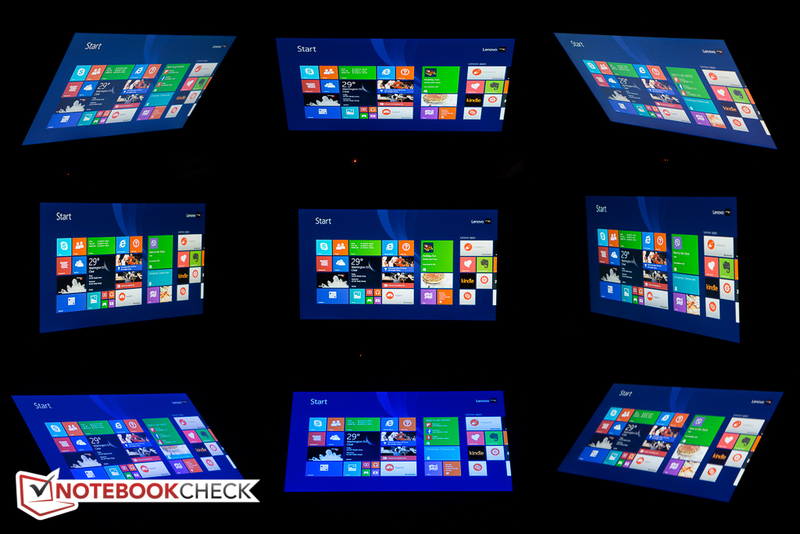 Given that this Ultrabook is more designed for the corporate environment, we are OK with the results. 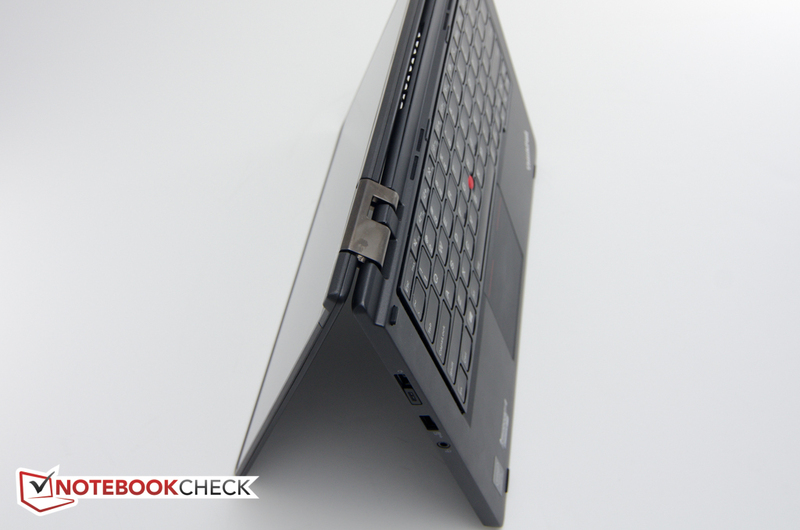 The ThinkPad Yoga is an exceptionally quiet Ultrabook. During idle, the system tethers on barely audible with just above 31 dB. Even under load and during our stress test, we never recorded values above 35 dB. The Dell XPS 12 reached up to 45 dB in this scenario, which can get annoying over time. The fact that the fan is located on the spine and thus directed away from the user also contributes to the excellent scores. 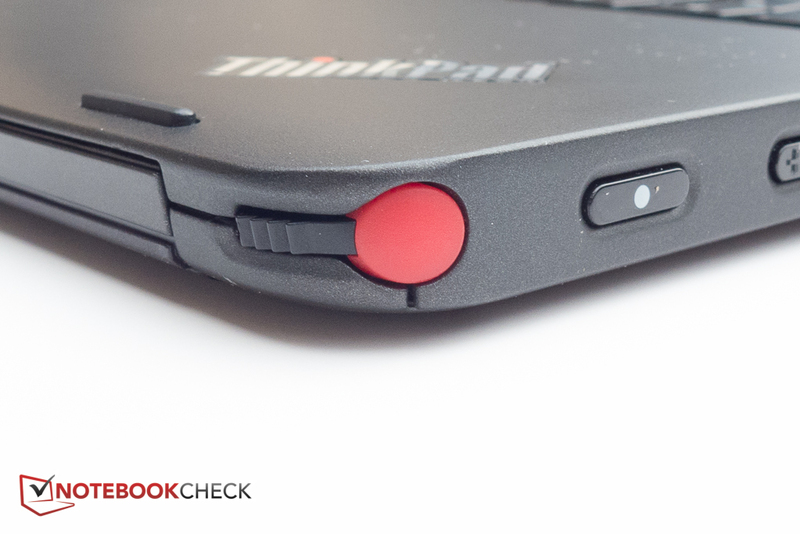 Despite the not very aggressive fan system, the ThinkPad Yoga doesn't get very hot. During idle, we measured a maximum of 27 degrees C, which is comparable to other systems. During load (stress test for at least one hour) the hot spot turnes out to be the right rear edge on the underside at about 45 degrees C, which can get a little warm when the Ultrabook is operated on the lap. The Sony showed a similar temperature high, whereas the Dell XPS 12 got even warmer at 52 degrees C. The position of the hotspots allows the convertible to be carried resting on the left forearm in tablet mode without any ill effects. 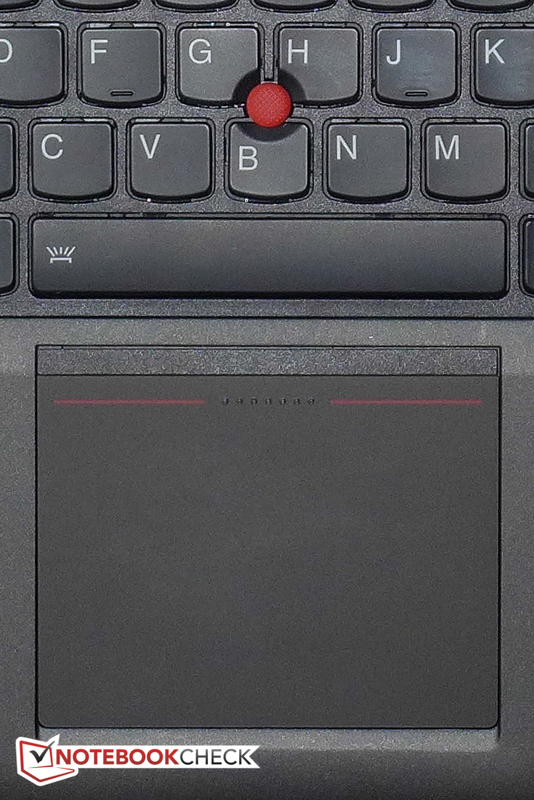 The palm rest to the left and right of the touchpad stays always cool regardless of the load level. (+) The average temperature for the upper side under maximal load is 28.8 °C / 84 F, compared to the average of 30.3 °C / 87 F for the devices in the class Convertible. (+) In idle usage, the average temperature for the upper side is 24.2 °C / 76 F, compared to the device average of 30.3 °C / 87 F.
To check for throttling, we use Prime95 and FurMark both individually and simultaneously. During idle, the CPU cores fluctuated between 2.3 and 2.6 GHz. Three minutes after starting Prime95, the CPU temperature had increased to 70 degrees C and the speed had decreased to 2.1 GHz with jumps to 2.2 GHz. At the end of the test (over one hour), the CPU frequency was still as above with a temperature of now 72 degrees C.
With FurMark active, the GPU immediately dropped from the maximum of 1000 Mhz down to between 600 and 650 MHz as the temperature increased initially to about 76 degrees C, which also coincides with the highest fan speed and thus system noise level. The temperature then subsequently started to drop to about 67 degrees C with a GPU clock of between 700 and 750 MHz clock according to GPU-Z. These values didn't change again until we stopped the test. During the full stress test (Prime95 + FurMark in parallel), the CPU dropped to 800 MHz more or less immediately with the GPU hovering around 600 MHz at a temperature of 73 degrees C. Checks 20 min, 40 min, and 1 hour later revealed no significant changes whatsoever - the CPU maintained 800 MHz, the GPU 600 MHz. A 3DMark 06 test immediately afterwards showed no significant drops in both CPU and GPU performance, however. This means that although throttling was observed, it will not really impact the performance in typical usage scenarios. Running the notebook on battery also did not alter the performance scores in any way. The stereo speakers sit in the rear edge in the gap between the base unit and the display and fire upwards. The sound quality is OK for presentations and watching movies, but bass is lacking and the highs can get very tinny. Although Lenovo mentions "Dolby Home Theater" in the spec sheet on their website, we could not find any such software preinstalled. Given our experience with the Dolby software on other systems, we wouldn't expect a huge improvement anyways. As always, we recommend hooking up external speakers or headphones to improve the listening experience. To determine the battery life, we run various tests with all screen and other timeouts disabled. To establish the maximum run time, we run the Battery Eater Reader's test. Here, we use the Power Saver profile, decrease the display brightness to its lowest setting, and disable wireless radios. The Ultrabook shut down after 13 hours and 17 minutes, which is a very decent result, although the number is not overly helpful. To more accurately simulate a relevant usage scenario, we run our WLAN test. We use the Balanced profile, set the brightness to 150 nits, and run a script, which visits different types of websites in 40 second intervals. Here, the Ultrabook lasted for 7 hours and 35 minutes, which is also a good result, although short of the XPS 12 by more than one hour. 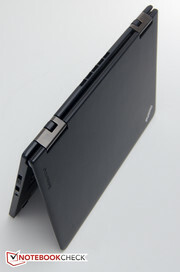 The Sony Vaio Duo 13 lasted 6 hours and 50 minutes; Lenovo's own ThinkPad Helix about 7 hours 18 min. To assess minimum battery life, we enable the High Performance profile, turn the brightness all the way up, enable all wireless radios, and run the Battery Eaters Classic Test. The Yoga lasted just a tad over 2 hours before shutting down. For most users, the 48 Wh battery will provide enough capacity to last through the average workday. 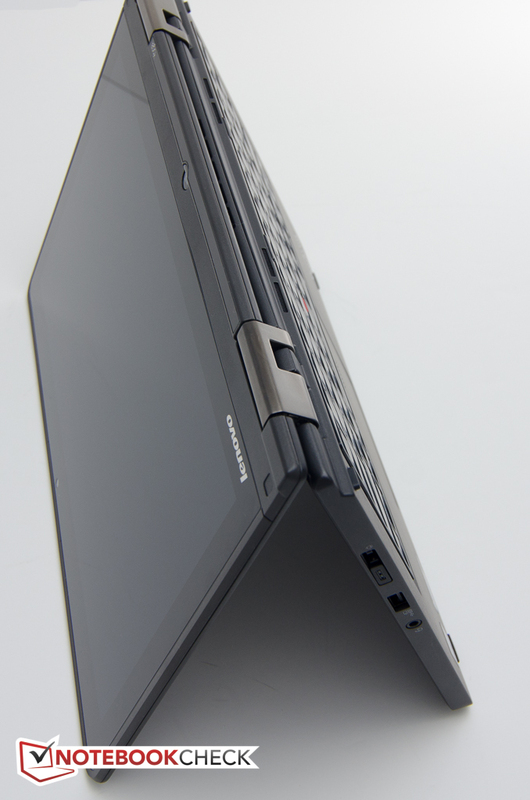 With the ThinkPad Yoga, Lenovo has successfully taken the 360-degree flip-hinge design of the consumer-level IdeaPad Yoga and adapted it for business use. 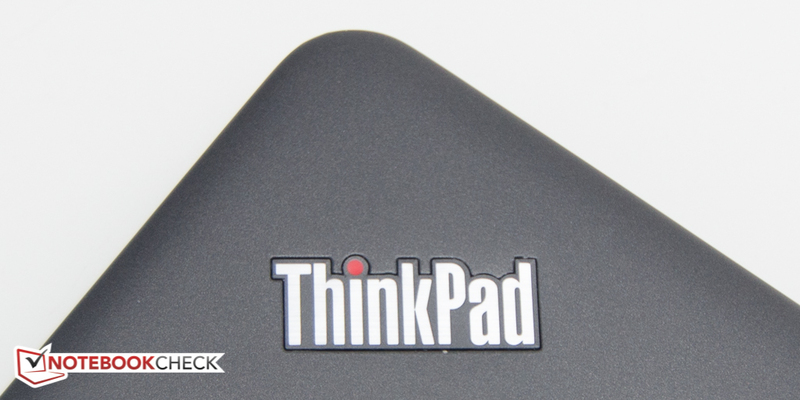 The ThinkPad Yoga is very well built and should withstand the rigors of the road for years to come. In our opinion, the keyboard is one of the best every to appear on an Ultrabook, and the nearly 8 hours of battery life should satisfy most users. 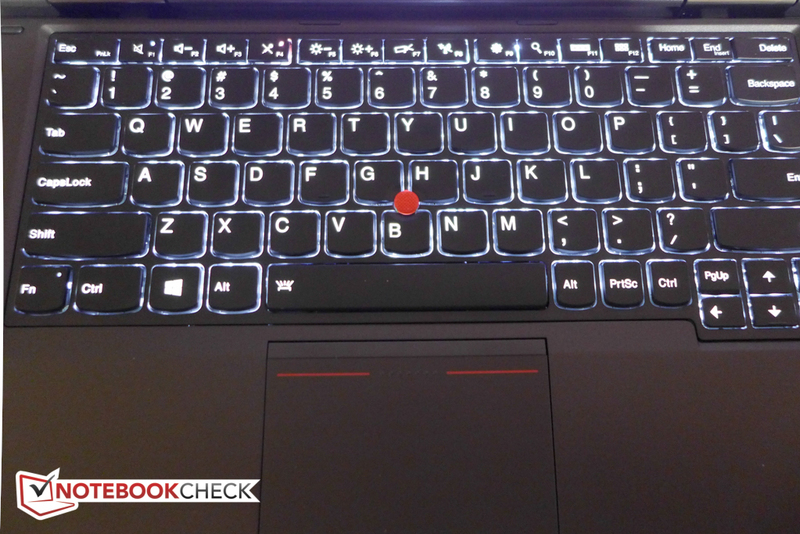 The Lift n' Lock-feature works very well and goes a long way to protect the keyboard when the Ultrabook is in tablet mode, although designs like the Lenovo ThinkPad X230T, Dell XPS 12, and the Sony Vaio Duo 13 don't expose the keyboard at all, which might be a better choice for some users, especially those who frequently need to put the convertible down while outside. 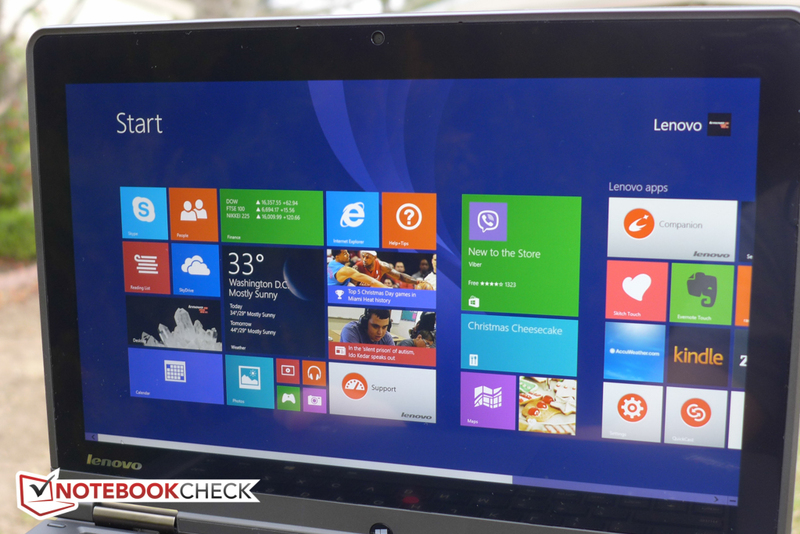 The 12.5-inch Full-HD touchscreen is not overly reflective, sharp and very bright. 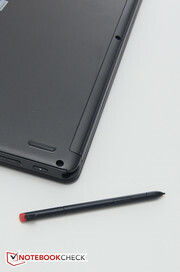 The active digitizer and pen will please graphic artists and note-takers alike. 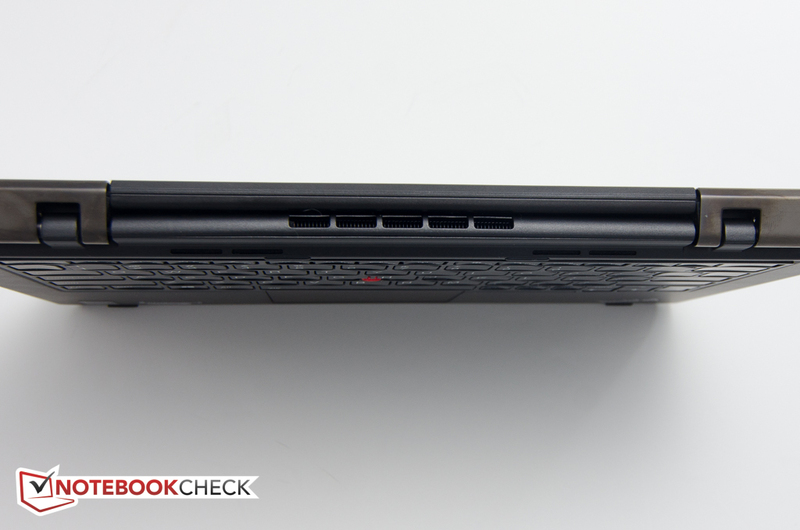 In our opinion, the cooling system could be a tad more efficient to prevent the CPU and GPU from stepping down under above-average load conditions, but other than that, we don't find much wrong with the ThinkPad Yoga. The Lift n' Lock design which protects the keyboard in tablet mode. A slightly longer battery life. A display that doesn't dim at all on battery. 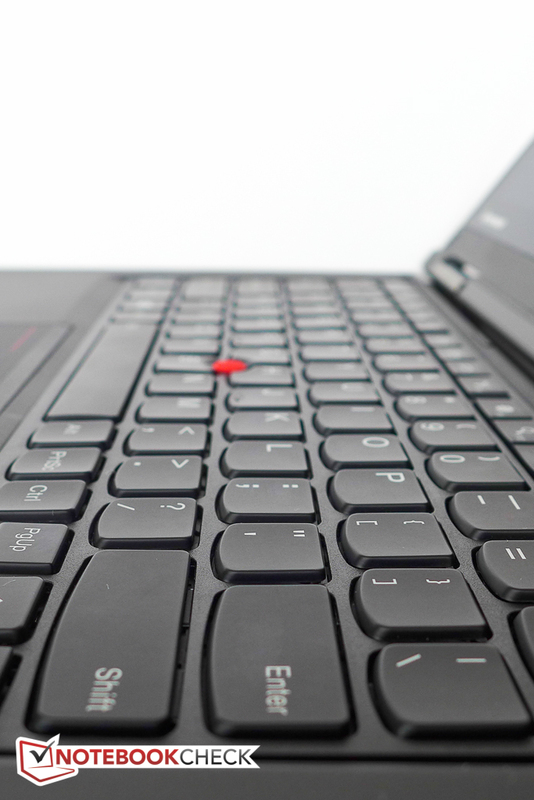 This marks Lenovo's third distinctly different ThinkPad convertible design.